Our local co-op (Seward) is having a sale on local, organic Winter Squash. I bought a bunch. (Will roast and stuff most of it.) Decided to try to turn a HUGE butternut squash into squash soup. After looking at several different recipes for squash soup, I improvised the following version. Turned out great! Toss the squash in 1 Tbls of the oil and spread in a single layer on a half-sheet pan or cookie sheet with sides. Put in the pre-heated oven to roast for 45 minutes to 1 hour. When the squash is almost ready, heat the remaining 2 Tbls oil in a large soup pot. Add onions and cook over medium heat until tender (about 10 minutes). One ingredient at a time, add carrots, sweet potato, potato, and apples, cooking for several minutes before adding the next ingredient. Add curry powder, garlic, and ginger. Stir until everything is well mixed and the curry powder has released its aroma. Continue cooking until the vegetables are almost fully cooked. Add roasted squash. Stir to combine. Add vegetable stock. Bring to boil, lower to simmer. Cook gently until all the veggies are soft. (I let mine simmer for an hour, but that probably isn’t necessary.) You may need to add more stock or water if it gets too thick. 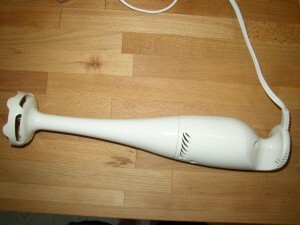 Remove the soup from the heat and puree with an immersion blender (aka “boat motor”) until smooth (how smooth? you decide). Garnish with some parsley or chives. Enjoy. If you hate trying to peel butternut squash, just cut it in half lengthwise, remove the seeds, and place flesh-side down on the oiled baking sheet to roast. After roasting, allow to cool and then scoop out the flesh and add to the soup. I’m sure this would work with whatever winter squash is available. I like butternut because it gets soft and sweet and isn’t stringy like some other squashes, but use what you like/have. I used a combination of Hot (1 tsp) and Sweet (1 Tbls) Curry Powders from Penzey’s Spices, but feel free to mix your own spice from any combination of: turmeric, coriander, cumin, fenugreek, ginger, nutmeg, fennel, cinnamon, white pepper, cardamom, cloves, black pepper, and cayenne pepper. Many recipes add some dairy (plain yogurt, half-and-half, sour cream) or coconut milk either at the end of cooking or when serving. It will help cool the spicy punch of the curry. I left out the dairy because I’ll be serving some of the leftovers at a gathering which will include folks who are avoiding dairy. The soup tasted fine without it.